Was there a Google Update on the 19th November? Published: Nov 20, 2015. 12:08 +0100. Current: Was there a Google Update on the 19th November? There are increasing reports of major movements in the SERPs this week (19th November) with some indicating that it may be a Panda Refresh, or simply the continued roll out of Panda (as Google did say it will be rolled out over some months). It is also possible it is just a change in the core algorithm, with content quality being targeted. That being said, we are still expecting a Penguin Update before the end of the year, which may change to a “real-time” algorithm, but as of yet (and this story is still evolving) there are no reports (complaints by link spammers) that it is Penguin related. SERP trackers provide an invaluable guide to indicate just how many websites are affected by the latest Google Update. MozCast at the current time only shows data up until the 18th November. This indicates that the update started rolling out a little earlier than the web chatter indicates. With an Algo Temperature of 83 degrees, the updates look fairly significant, but we won’t know for sure until a few days time. MozCast The Google Algorithm Weather Report. © Moz. 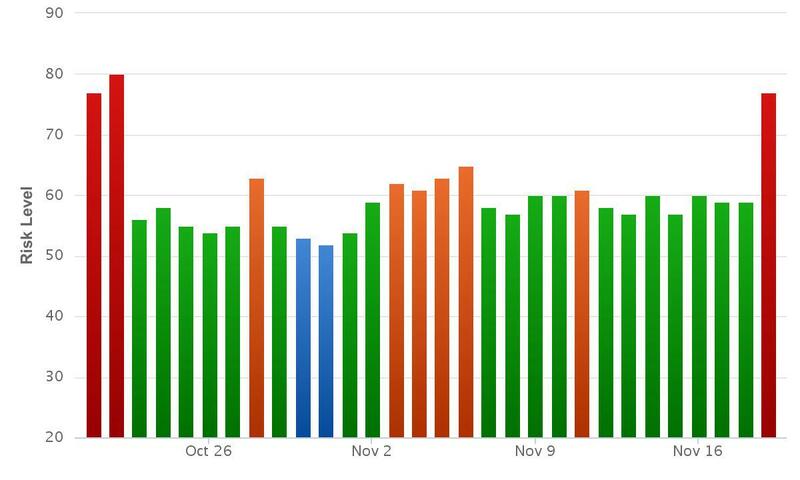 This SERP tracker shows data for the 19th November, and it mirrors the rise seen in MozCast. Algoroo shows data up to the 20th November. Instead of a spike over one day, the increase in activity seems to be spread out over several, starting on the 17th November. This could just be due to the way the data is interpreted. What did Google have to say about the SERP Volatility? John Mueller, webmaster trends analyst at Google responded to some tweets about the recent volatility. Reading between the lines, it sounds like it was a core algorithm change, rather than Panda or Penguin. @dawnieando @rogala_pro @methode most likely, yes. We make 100s of changes every year. Don't have anything more specific to announce, sorry! While this story is evolving, and we will update it as we get more information, our suspicions is that it relates to website quality. This could be either related to Panda, or a change in the core algorithm. We did notice a temporary uptick in traffic around a week or so ago, and fluctuations were seen in both MozCast and the Rank Risk Index around this time. It is possible they were testing these current changes, or indeed the changes we are now seeing are just a continuation of those tests \ algorithm tweaks. Editor’s note — 20th November: Google’s John Mueller responded to questions about the update with an indication that it was a core algorithm change. We have updated the article to reflect this new information.